Entry, Patio, and Replacement Storm Doors | ALCO Products Inc. The doors on your home have multiple jobs, but it all narrows down to one thing: keep what’s outside out, and what’s inside in. They must be strong enough to withstand the Mid-Atlantic temperature fluctuations, would-be intruders, and all the elements that the Maryland, Virginia, and Washington D.C. area brings. When Is It Time For a New Door For Your Home? The doors on your home have multiple jobs, but it all narrows down to one thing: keep what’s outside out, and what’s inside in. They must be strong enough to withstand the Mid-Atlantic temperature fluctuations, would-be intruders, and all the elements that the Washington D.C., Maryland, and Virginia area brings. You simply want a new door! When your doors need to be replaced, it can drastically alter the energy efficiency of your home – which means any room that has an exterior-facing door can be too cold in the winter and too hot in the summer. Or you may feel a draft as the wind blows past your door and the air currents enter your home. You may be tempted to install weather stripping to solve a draft problem, or perhaps use a draft-stopper under the door to stop air from leaking in underneath. But oftentimes, the air is coming in from the area around the door where it’s not hanging level or the frame no longer meets the door correctly. When this happens, it usually means that it’s time for a new door. It’s not just your windows that protect your home against precipitation – your entry and patio doors play a large role in keeping the elements outside while keeping the inside of your home nice and dry. When your door fails to keep water from entering your home, you can see water damage in your floor and carpets, as well as the walls surrounding your door and the lower levels of your home as well. Water will travel as far as it can, and it doesn’t always move straight down. You can see water damage in all directions if it’s coming in from a failing door, and when you see water – it’s time to get a new door. Whether you have one door or many, they are the first line of defense against would-be intruders who wish to break & enter into your home. Oftentimes, burglars will bypass a home if it proves too difficult to enter – so your door’s job is to be difficult to enter! This is achieved through reinforced deadbolts, durable door materials, and upgraded framework that will withstand a brute-force attack. The older your door is, the more susceptible it is to failure during an invasion attempt – which means it may be time for a new door. When we come to replace your entryway door, we first start with a visual inspection of the area to ensure that all the materials surrounding your door are sound and in good shape. Then, we begin by removing your existing door. We take out the door and the frame, as well as the exterior brick molding. We work to save the interior trim if possible, but replace it if it becomes warped or broken. After we’ve removed the door, we inspect the opening to check for mold, mildew, moisture or rot – if any compromised materials are found, we will alert you immediately and let you know your options for remediation. The new door comes pre-installed with its own door frame, so we’re able to slide that directly into place where the old door and door jamb came from. We reinstall the interior trim (or install new trim if required) and then seal inside with interior-grade caulking to prevent any air leaks. Outside, we replace the brick molding and wrap the exterior in trim foil to protect the trim as well as create a fully finished look. After that, the door hardware is installed and you’re ready to enter your home in style! 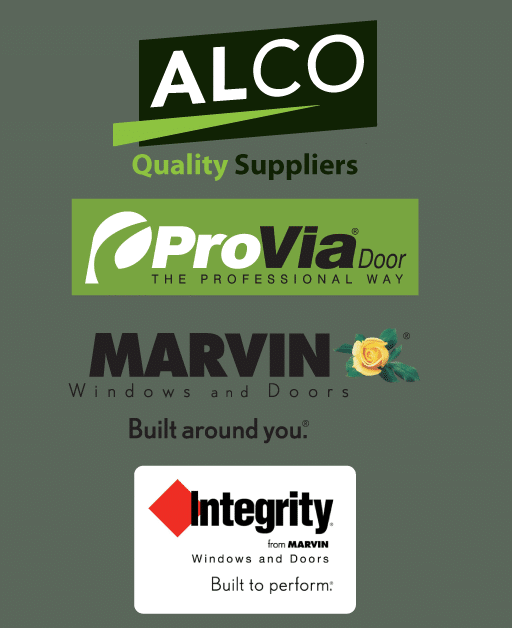 ALCO stands behind not only the workmanship we provide but the products we use. If your new door is still under manufacturer’s warranty and there is a defect with the materials, ALCO will provide labor free of charge to repair or replace the product that we installed. That means if you need your door repaired or replaced because of something ALCO or the manufacturer did, we’ll come and do the work for free. Alco only sells and installs replacement doors that are exceptional in quality and durability. We custom design and measure every door for an exact fit which makes the door more secure and energy efficient. We only sell doors that are made from premium materials and are created by an expert craftsman. Ready-made doors that are cut down to fit instead of being built to exact measurements can’t compete with our custom designed doors. In reality, doors are not only your homes first line of defense but they convey your style and personality. The many styles, colors, and hardware allow you the opportunity to customize your door to truly convey yourself. 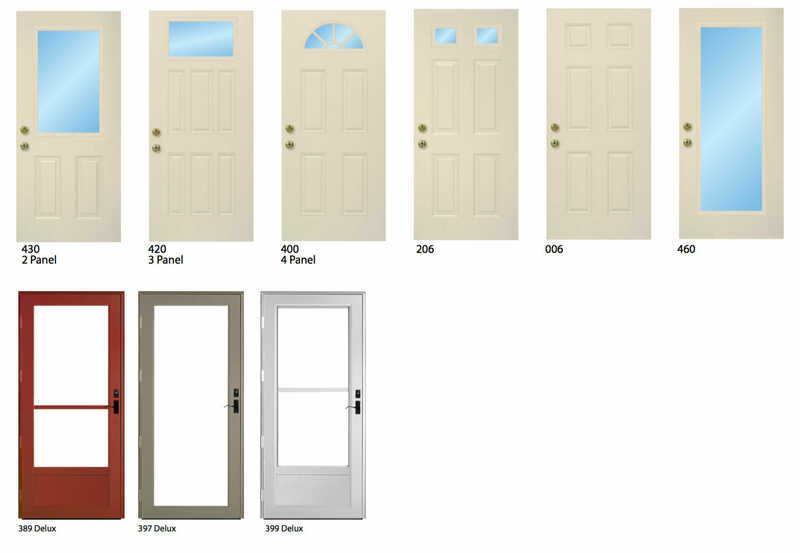 When you’re choosing a new front door for your home, you have a few different options to choose from.  Solid doors with no window afford you the highest energy efficiency and security of all the front door options. However, these doors don’t allow any daylight to enter the home and lack some decorative options. These doors can be made in any material, from wood to metal to fiberglass. Each material has its own benefits, and you will be able to choose based on its durability, maintenance level, and security ratings. Within the windowed door options, you can run the gamut from small windows at the top to nearly fully windowed doors. As a rule of thumb, the larger the window, the more energy you will lose from your home. There are ways to alleviate the energy loss, but the window is less energy efficient than the door around it. That’s why many companies are fond of saying that your door is only as effective as the window that’s in it. That being said, there are many options for the windows that you have – from plain glass to decorative glass, even stained glass. Your front door can come in a myriad of colors – from neutral to bright – and many doors can be painted. This leaves your color options virtually limitless. Additionally, wood and fiberglass doors can offer you another option: wood grain. Choosing a wood grain for your door can add to the richness of your entryway, rather than choosing a statement color. This is especially striking if you incorporate a decorative window into your door to add to the overall look. 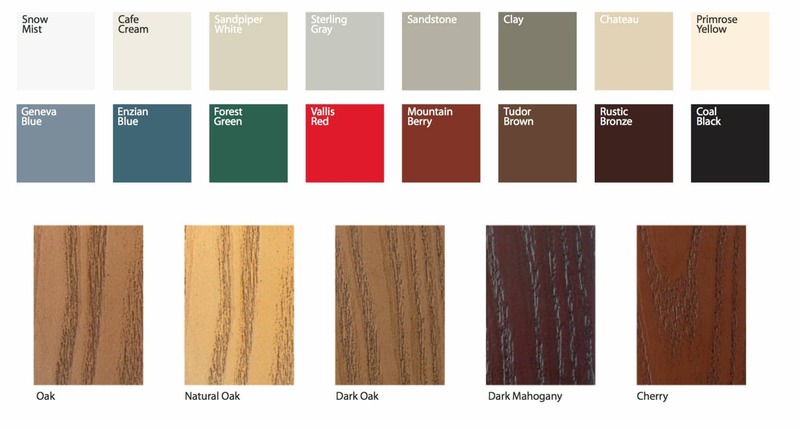 Below are just a few of the color options that ALCO can bring to you – to see all the colors and wood grains, schedule your Complimentary Design Consultation. As we mentioned previously, you have multiple glass options in your entry door. Plain glass windows can be multi-paned, which can increase energy efficiency. Additionally, you can add argon gas in between the panes to decrease the U-Factor (the amount of heat that’s lost through the window) – which in turn will increase its efficiency. Fiberglass composite doors are the lowest-maintenance doors, and are especially well suited for humid climates. Steel doors are the best choice if you want an extra layer of security beyond reinforced frames, deadbolts, and solid strike plates. Wood has commonly been used because of its durability and flexibility, although fiberglass has replaced it as technology and materials have advanced. 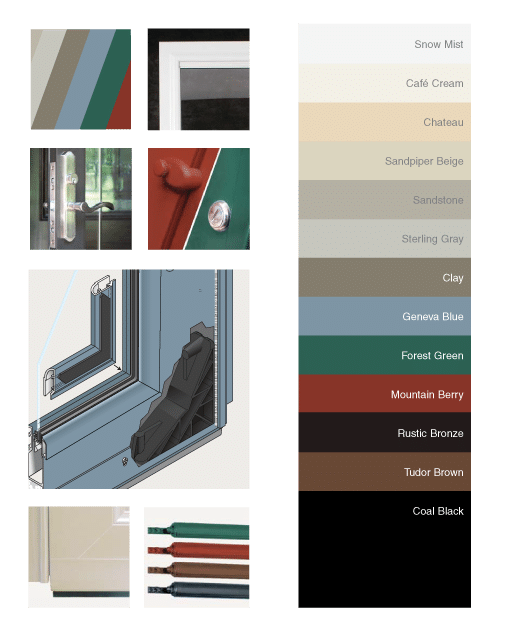 While each material has its own pros and cons, there are a variety of options in each material so there is sure to be something that suits your needs. The hardware you choose for your entry door depends on your own personal style, and the amount of security you want. There are lock mechanisms that operate only on a deadbolt, and others that have a locking knob as well. Additionally, there are lever-style knobs that are easier to open for those with disabilities (or an arm full of groceries), as well as the traditional round knobs or push-button style. The hardware on your door is easily replaced using materials from your local hardware store – but be aware that they have a limited number of keys to those locks, so you may want to have the locks changed out by a professional locksmith to ensure its uniqueness to your home. Keep precipitation and wind out. Represent your style to the world. 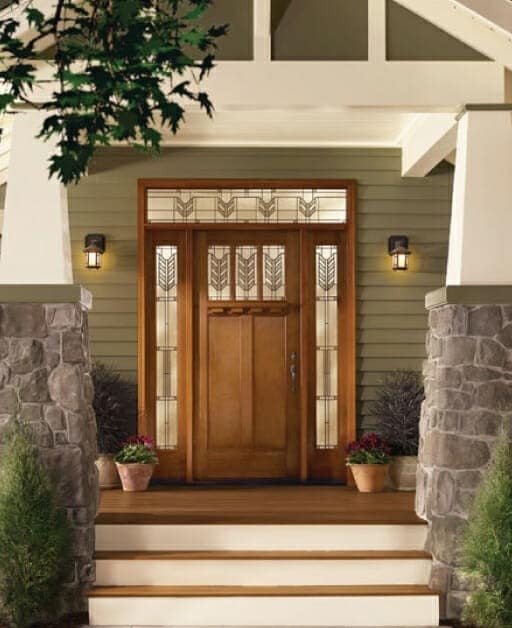 Front entry doors come in a variety of materials – wood, metal, and vinyl. There are advantages and disadvantages to all styles, and what you’re looking for will determine the material that best suits your needs. Fiberglass composite doors are the lowest-maintenance doors, and are especially well suited for humid climates. Fiberglass doors can mimic the look of wood grain, and can be stained to match virtually any wood variety. Fiberglass doors are filled with insulation to increase their energy efficiency, as are steel and wood doors. 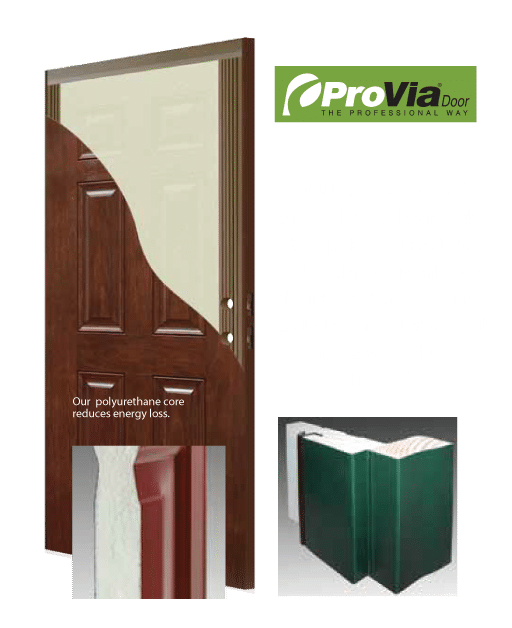 Fiberglass doors have a higher R-value (the resistance to conductive heat flow, which means the amount of heat that passes through your door to the outside) than solid wood doors – about five times as much when you choose a fiberglass door without a window. Steel doors are the best choice if you want an extra layer of security beyond reinforced frames, deadbolts, and solid strikeplates. Steel doors are stronger than wood or fiberglass doors, which makes them especially useful against extreme weather or would-be intruders.. Steel doors can be designed to be as elegant and high-end as wood and fiberglass doors, and can be painted to match the colors of your home’s exterior. The R-value of a properly installed steel door with foam insulated core mirrors that of a fiberglass composite door. In fact, fiberglass and steel doors are the most energy efficient door types for your home. Wood has commonly been used because of its durability and flexibility, although fiberglass has replaced it as technology and materials have advanced. Wood can be painted or stained to enhance its natural beauty, which means it can match any color scheme you wish to match. You can find wood doors with engineered cores, insulation, or solid-wood doors – all of which are highly customizable to your specific style requirements. 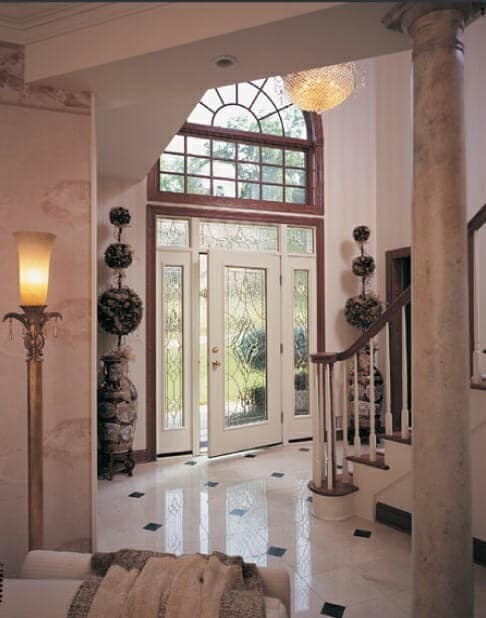 Additionally, entry doors come in a variety of styles – solid doors, doors with glass or stained glass inlays, and with a variety of designs and colors. No matter what your home’s style, ALCO can help you find a front door to suit your needs. The addition of a window, although decorative, reduces the energy efficiency of that door, so be sure to talk with your ALCO representative about your options and preferences. French doors for your Maryland, Virginia, or Washington D.C. home are a suitable choice for both exterior doors and interior room dividers. French doors are hinged on the left and right sides and close into one another so that when they’re open, they provide a wide walkway. As with swinging patio doors, you’ll need to ensure that you have a proper footprint for the swing of the door – that means keeping furniture and other items out of the way so the door can open completely. French doors benefit your home with the increased light and space they bring to a room. With their full-window design, French doors allow a large amount of natural light into your room, and with the views they provide, they can make your room appear and feel larger. If your exterior doors will get direct sunlight, you can choose a tinted or coated glass option that will keep your floors, furniture and décor from fading. Additionally, look for a door with a low Solar Heat Gain Coefficient (SHGC) which is the measurement of how well your glass will block the heat from the sun. The SHGC is measured from 0 to 1, and the lower the number, the more heat the glass blocks. In southern climates, a SHGC of 0.25 is recommended while a higher SHGC of 0.4 may be required in the northern US – which means that your ideal number will likely fall within that range depending on your preferences and requirements. French doors for your patio come in many different design options and colors, all of which become a design element for your home’s exterior as well as the inside of your home. Vinyl is used often for its durability and energy efficiency. Vinyl doors will not need to be repainted, flake, peel or rot, which makes vinyl an especially popular choice. Fiberglass can be made to mimic genuine wood but require less upkeep. Fiberglass doors are built to consistently withstand any climate – from hot and dry to cold and wet. This makes fiberglass doors a great choice for the Mid-Atlantic seasonal changes. Aluminum is lightweight yet strong, and is incredibly corrosion resistant. This makes aluminum a good choice near water or other corrosive situations, and when you’re looking for a door that will be durable in many situations. Wood doors are used for their unique beauty – as every tree is different and offers different distinguishing features. Wood doors can be painted or stained in any color to match your existing style, and its natural durability will ensure it lasts. 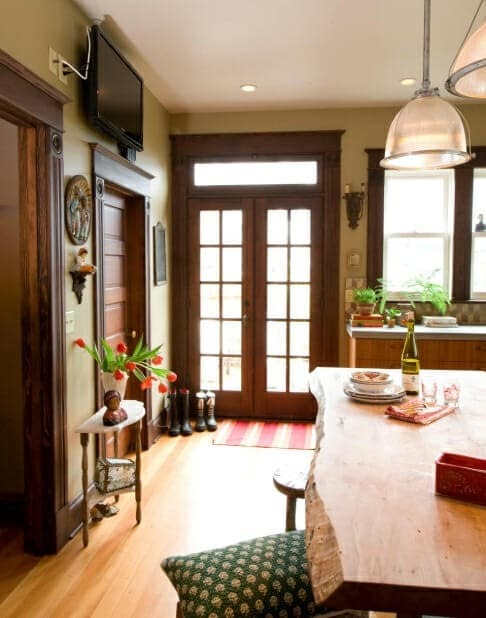 Wood doors to require more maintenance than other materials, but is especially suited for a traditional style home. Steel doors are designed to be incredibly durable and strong – making them the top choice when security is your largest concern. These doors require minimal maintenance and will remain durable n most climates. In addition to the material of the door construction, you also have the option to include window grids or omit those entirely. You also have the decision of the style and finish of the hardware (handle and hinges) that you use – from antique bronze to chrome, there’s a finish to meet every style. Sliding Patio Doors come with at least two panels, one of which slides and the other that is stationary. Sliding patio doors are an incredibly popular choice residential homes in the Virginia, Maryland, and Washington D.C. area. Partly due to the fact that they don’t require any footprint in – or outside of the home. Sliding doors are a top choice for small decks, tight spaces, or homes with strict furniture arrangements because they don’t swing in or outside of the frame. Sliding doors also frequently have a sliding screen, which allows you to open the door and increase the air flow in your home. Because sliding doors operate on a track, they’re prone to debris increasing the friction on the wheels and decreasing operation. They can also be difficult to operate one-handed due to their weight and size, which is a consideration when choosing this style of door for your home. Sliding patio doors typically come with fewer color and material options than swinging patio doors, but you do have an additional security measure with a “charlie bar,” which is a piece of wood or metal that prevents the door from opening using a physical barrier. Sliding glass doors, unfortunately, lose more heat than any other style of door due to their all-glass construction – it seems that the very thing that makes sliding doors attractive is the one thing that will increase your energy consumption. Many manufacturers are reducing energy loss from home patio doors with similar techniques that are used in windows – multiple panes with a thermal break, which is simply a plastic insulator between the two frames. This insulator works to prevent heat or cold from traveling through the material and being lost outside your home. Another thing to consider is whether your sliding glass door will be east or west-facing; if so, pay attention to the Solar Heat Gain Coefficient (SHGC) which is the measurement of how well the windows and glass doors block heat from the sun. SHGC is measured from 0 to 1, with the lower numbers meaning that less heat is transmitted into the home. For west-facing doors, strive for a number in the 0.25 range as that’s recommended for southern climates to reduce heat build up and should be more than enough to satisfy your requirements. ALCO can help you determine whether a sliding door is right for you during your complimentary evaluation. Swinging Patio Doors operate in a very similar way to exterior hinged doors. They’re hinged on one side and swing inward or outward, depending on your specific need. While they come with an ease of use because the handles are easy to operate, they do require a specific sized footprint that you want to ensure you have available in your space. Additionally, swinging patio doors do not come with a screen, whereas sliding patio doors almost always come with a screen door included. Swinging patio doors come in a variety of materials – from vinyl and fiberglass to steel and wood. Your decision depends on your desire for durability, security, and aesthetics. With fiberglass, you can achieve the look and feel of real wood without the upkeep required. Fiberglass doors are built to resist any climate and to require minimal painting and repair. Wood patio doors require more upkeep – whether staining or painting – but are built to resist the elements and also to provide a unique, rich look and feel to your door. Steel patio doors are an economical option, offering durability and strength and minimal maintenance. Steel doors also offer an added benefit of being intrusion resistant. Many steel doors are treated to resist rust and moisture. Vinyl doors are chosen for their affordability and durability, as well as its extreme energy efficiency. Vinyl doors are designed to never fade, peel or rot because the color is baked into the material itself. Whatever material you choose for your swinging patio doors, there’s a design and color option to fit your home. Keep in mind that the material you choose will have little impact on your overall energy rating; in fact, it’s more the material that the window consists of that will impact your energy use. When choosing your door, discuss with your ALCO representative the differences in energy efficient options. For instance, you want to find a door with a low U-Factor – the measurement of how well your door prevents heat from escaping – and that can be achieved with the addition of thermal spacers, dual or triple panes, and the addition of Argon or Krypton gas insulation in between the panes. As with other entry doors and interior doors in your home, the hardware you choose can complement the door and your home’s aesthetic. You can choose handles and hinges in multiple finishes, from chrome to oil-rubbed bronze to brushed satin nickel – whatever style you choose for your home. Additionally, you can choose to have crossbars (muntins) in between your panes of glass or not – depending on the aesthetic and style you’re looking for. Your ALCO rep can show you the options that you have and help you choose the best fit for your home. Storm doors are a relatively low-cost way to protect your home, increase the life of your exterior door, and increase your energy efficiency. Additionally, storm doors have screen options that give you the opportunity to increase the ventilation in your home while also increasing the amount of natural light you let in. Storm doors increase your energy efficiency by creating an extra pocket of insulation at one of the main places that air escapes your home – your front door. When you have cracks along the top, bottom and sides of your main entry door, a storm door can offset some of that energy loss. There are options you can take to increase your storm door’s energy efficiency, too, like choosing a door with multiple panes to increase the U-Factor (the measurement of how well your door prevents heat from escaping.). If your door is east or (especially) west-facing, consider researching the Solar Heat Gain Coefficient (SHGC) of your chosen material. The lower the SHGC, the more heat is blocked from the sun. This will help you keep your home from heating during the summer months in hot afternoon sun. Lastly, a storm door typically comes with a locking mechanism, which gives your home an added layer of security or barrier against intruders. 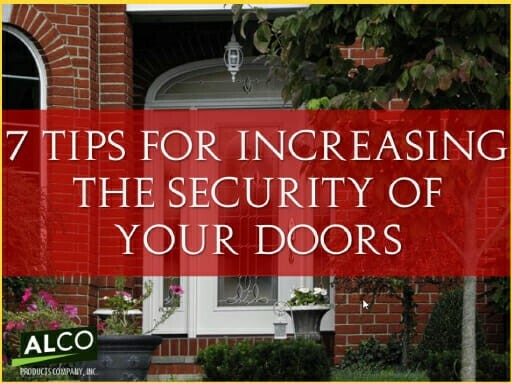 And if you want to protect yourself against unwanted visitors, you can screen them before you unlock your door to them. Storm doors come in a variety of styles, materials, and colors. You can choose to have an all-glass storm door, one with decorative metal finishes, or one with a built-in screen for airflow. You can choose a dark or a light storm door, and most doors are able to be painted to customize the look of your home. Additionally, the hardware you choose for your door handle can complement the color of the door, the style of your home, and the hardware you use on your doors and windows surrounding the door. Talk with your ALCO representative about all your options and we can help you design the perfect door for your needs.